The cortical collecting tubules (tubuli colligentes corticales) are continued in the medulla by the medullar collecting tubules (tubuli colligentes medullares) who converge in a single collecting duct (ductus colligens) at the apex of the medullary cone, which in term merges into a second branching of the ureter (ramus uretericus II). 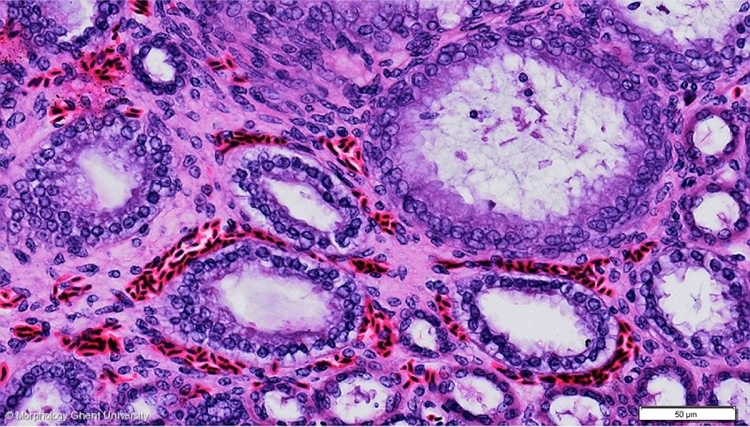 The lining epithelium of the smaller medullary collecting tubules is low columnar and it becomes high columnar with increasing diameter. The ductus colligens and the ramus uretericus II have a pseudo-stratified columnar epithelium.